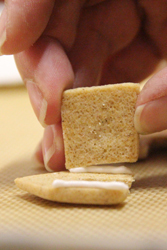 In 2006, Roger A. Pelcher built a 36,600 ft-square gingerbread house at the Mall of America in Minnesota. The house was 60 ft. tall, a bit over 45 ft. long, and about 35 ft. wide (you can see pics of it at SuperSizedMeals.com). Insanity! 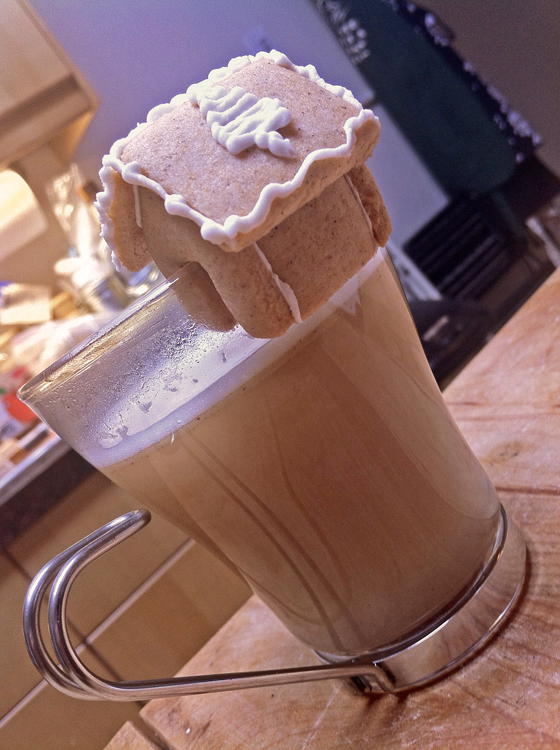 Well, not that I was going for the record of World’s Smallest Gingerbread House or anything, but when I saw these tiny cookie creations (from awesome Polish website CakeTime), designed to perch on the edge of your mug of hot cocoa or spiced apple cider (or Hot Buttered Rum! ), I just had to build some. 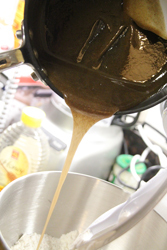 I started out by making the dough; this recipe uses honey instead of molasses, which gives the gingerbread a wonderful, delicate flavor, and beautiful, lighter color – molasses can sometimes be overpowering in flavor, and it’s dark (which is why most gingerbreads are that deep brown color) – using honey lets you see the spices in this pretty dough. 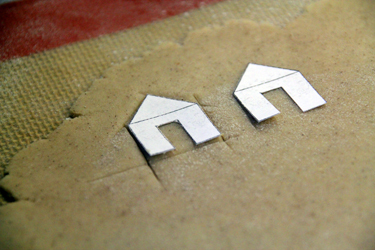 I rolled the dough out to about a 1/8-inch thickness and then used CakeTime’s template (thank you, CakeTime!) to cut out my little house pieces (I rolled my dough out on a silicone mat, so just used a thin pie server as a knife so as not to cut the mat). For the doorways, I took a page from another website I found that had also created mini gingerbread houses (NotMartha.org – thanks, Megan!) 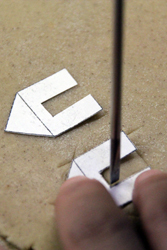 and used a clean mini screwdriver to help make my cuts. It took a while, but I got all my pieces cut. 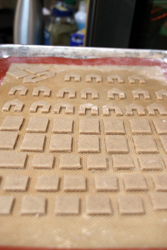 The trick with these is to cut everything and then remove the outer dough – since these pieces are so small and the dough is so thin, you don’t want to try to move the pieces themselves (hence my use of the silicone mat to roll and cut directly on). 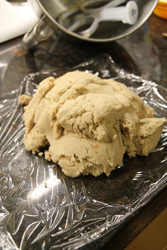 All set, and into the oven! These bake in only about five minutes. 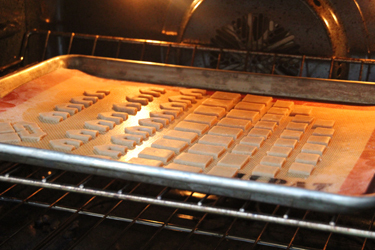 I hate waiting for cookies to bake, so these tiny guys are awesome! 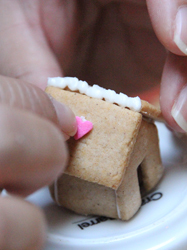 After the pieces were cooled, I began constructing my houses. I used a recipe for royal icing from FoodTV.com (an Alton one, of course), and used a quart-sized freezer bag with a tiny corner cut off for my piping bag. 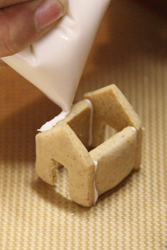 Because royal icing dries pretty quickly, and dries hard, you really should use the piping method. I tried building my first house with just what was left on the rubber spatula I used for mixing, and that house didn’t stick together well. 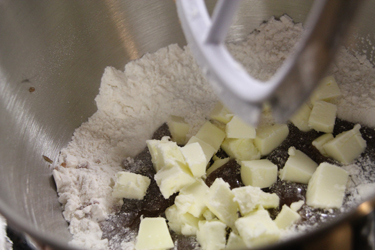 You need to be able to pipe, and then almost immediately after, place your cookies. After getting the house framework frosted together, I let them set for a few minutes, just resting on their faces still (right when they’re piped, they’re still a bit fragile, but they dry quickly so if you muck them up too early, they might completely fall apart and you’ll have to rebuild all over again). Once they were set enough for me to put them upright, I attached the roofs. 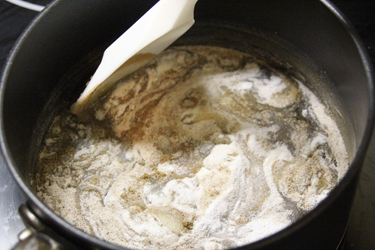 Depending on the thickness of the dough, the spot where the roof pieces join may leave a pretty big seam. 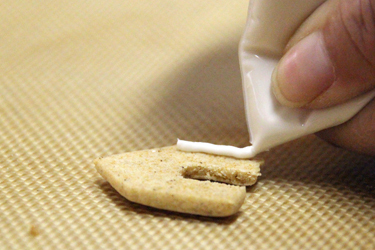 Here’s where the decorating begins – you just fill that little valley with some more icing. So cute! Now, you just decorate to your heart’s desire! 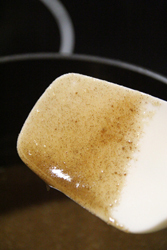 You can make more icing or divide up what you have left, and add food coloring to different batches, you can add candy embellishments – make them as detailed or simple as you want. I didn’t have much time, so I just did some basic designs and used mostly piping to decorate. These are adorable! A perfect little treat to add to any mug or cup! 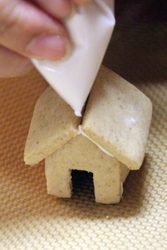 This is a really cute, simple, fun little cookie project. 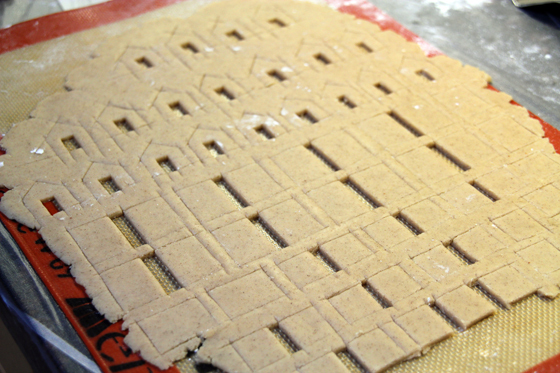 I only used half the dough recipe and was able to make 15 houses, with dough still left over (you can probably get a total of 20-25 houses out of half a recipe of dough, depending on how thin you roll your dough – if you’re careful, you really can roll this pretty thin and the houses will be delicate, but even more magical). I also only made half a batch of the royal icing since I knew I wasn’t working with a full batch of cookies. 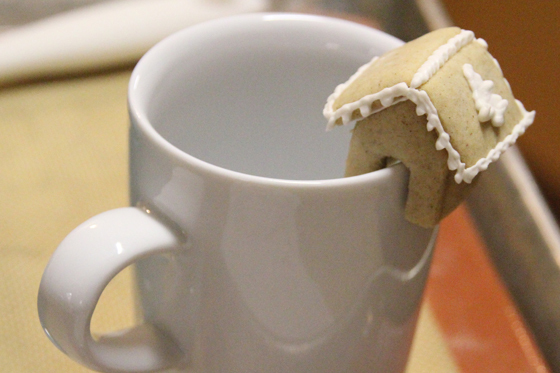 One tip I also got from the NotMartha website is to check that your doorways are big enough to fit on your mugs *after* they’ve been baked since the cookies will spread a bit in the oven. 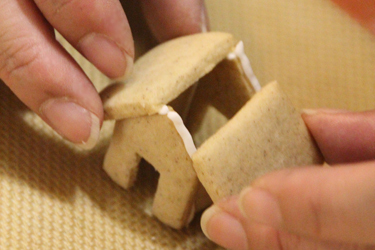 NotMartha made a prototype of one complete house first and adjusted accordingly, sometimes cutting the doorways a bit bigger when the cookies had just come out of the oven. 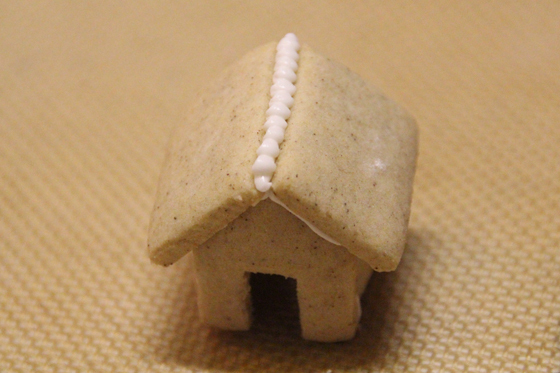 While I didn’t have enough time to make a prototype house, I basically went ahead and enlarged the doorways after the cookies came out of the oven, except that I didn’t get to all of them because company started coming! It ended up being okay since I have both ceramic and glass mugs (the glass is a bit thinner), but make sure if you do this, that you remember to double check your doorway size after baking! 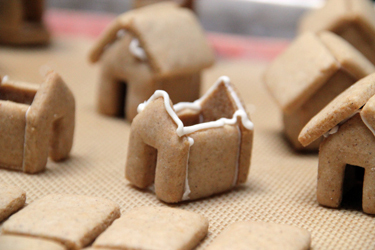 While this project is not that difficult, and is a lot of fun, there is some work involved and it would be such a bummer if after making all these adorable houses you found they didn’t fit on your mugs. 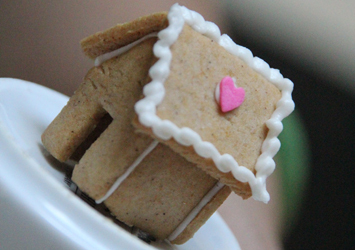 All that being said, I really enjoyed this – and the cookie houses are DELICIOUS! 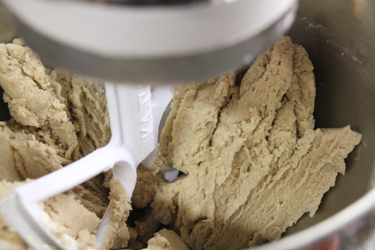 I still have the other half of the dough in the fridge – I can’t wait to make more of these! These are so adorable…and tasty!